Unique blend of 4Thyme cultivars. Effective against MRSA and many other pathogens. We are so happy to be among only a few Aromatherapy Companies here in the United States to be able offer you Benchmark Thyme. This essential oil is relatively new, but we have been amazed at its gentle power and dynamic versatility. 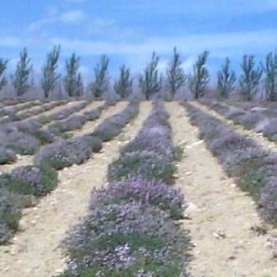 Did you know that there are more than 300 different varieties of the thyme plant? And oils extracted from the different species ARE different! We have a variety of thymes at Stillpoint! Maggie Tisserand is the developer and researcher who is responsible for Benchmark Thyme. Maggie states on her website that Benchmark Thyme is a unique blend of ethically grown (chemical and pesticide free) Thyme cultivars, carefully chosen to provide the most effective composition of anti-bacterial aroma-chemicals, whilst being gentle on the skin. There are around 350 species of Thyme (many with sub-species) and four make up Benchmark Thyme - grown and distilled in the UK. This unique blend of ethically cultivated (chemical and pesticide free) Thyme cultivars has been carefully balanced to provide the most effective components of both Tea Tree oil and Thyme var Linalol, with an antimicrobial effectiveness greater than either individually offers. Works faster than Teatree - Microbiology kill curves demonstrate that it can take only 2 hours for Benchmark Thyme to kill the most powerful MRSA & MSSA bacteria in vitro, but up to 24 hours for Tea Tree. Is a synergistic blend proven to kill MRSA in-vitro. Less irritation on the skin than other effective anti-bacterial essential oils. The uniqueness of Benchmark Thyme is that it is a combination of aroma-chemicals (please see the chart in the aroma- chemistry section) that is unique in its overall composition. Some aroma-chemicals like terpinen-4-ol can be found in Tea Tree oil and some, like linalool, can be found in Thyme Linalool, but only in Benchmark Thyme do all of these aroma-chemicals (and more) come together in a synergistic combination; all from our four thyme cultivars. The name thyme originates from the Greek word “thymon” meaning to fumigate. It is also thought to be derived from another Greek work “thumus” meaning courage. The thyme plant was associated with bravery. Roman soldiers bathed in a bath infused with the herb before going into battle. And for the knights of the Crusades, thyme was sewn into their scarves.